The experience led me to do a little research into how these bizarre bottles wind up on planes anyhow. 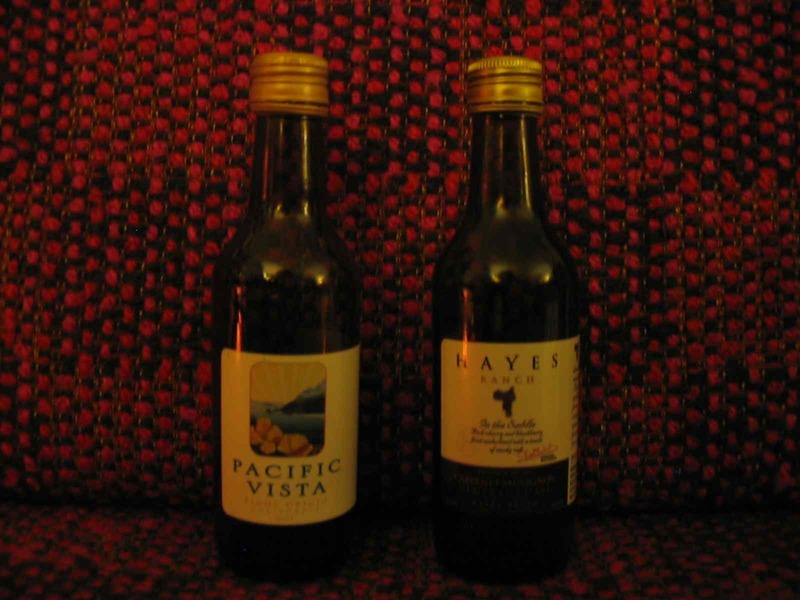 What follows is a grim story of bulk wine sales, “Pacific Vista,” and the cluelessness of the American airline industry. When I got on the plane I was already rockin’ a buzz from a double Dewars on the rocks that I’d downed in the terminal, so I was feeling a little too belligerent to possibly settle for a subpar wine experience. Things got off to a good start when I asked the steward (a friendly guy with a goatee who looked more like he should be a roadie for Phish) what kind of wines were available. “Red and white,” came his reply. “Sounds promising,” said I, “but what kind, exactly?” To this he offered the following response: “does it really matter?” Verbatim… I kid you not. In retrospect, I realize that he was probably just joking around — one shifty-looking miscreant recognizing another and engaging in some playful rapport. However, I’m quite convinced that some top exec at AA, when asked what kind of wine the airline should serve its coach-class customers, probably dismissed the question with the same glibness. Pressing the good man further, I learned I had three options: a California Pinot Grigio, a Central Coast Cab, and a Chilean Cab. I have nothing against South American wines (as anyone who read the LA Times piece will know), but I figured the only thing that could make a cheap Chilean Cab worse would be drinking it out of a plastic cup on a plane, so I skipped that one and bought the two Californians in their quarter-bottle (187 ml) sizes. 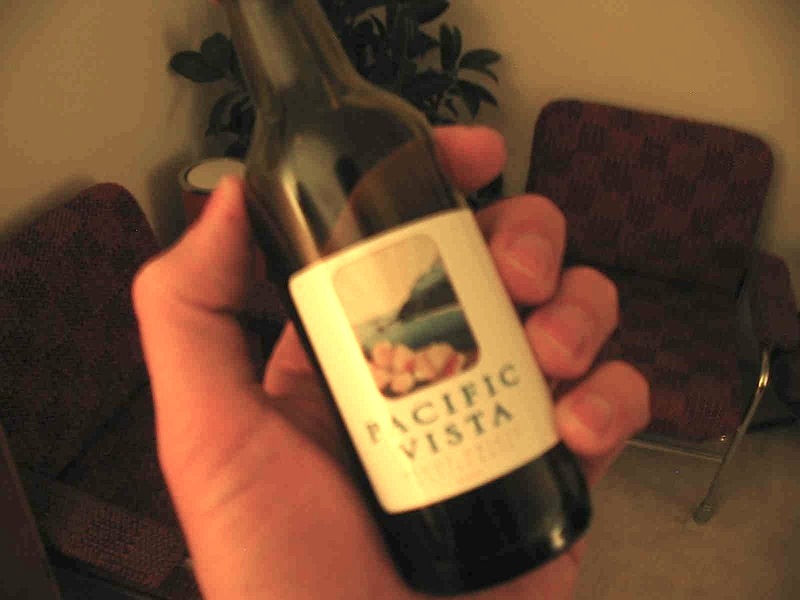 The 2005 Pacific Vista Pinot Grigio (California) was an odd little affair. The image on the label looked more like the logo of a discount Hawaiian rental car company than any Pacific vista I’ve ever seen. The wine had classic P.G. pigmentation, light and sandy, which I thought might be a good sign. I got my nose wet (twice) trying to get a bouquet out of those ridiculous plastic cups, but finally I turned up notes of apple juice and butter. This melted into laundry detergent and eventually revealed some mineral notes. Overall, a fun nose and more than I expected. The palate, though, didn’t offer much. Light sour apples at first, with some harsh acidity going down. There was a prevalent lemon character — and not a pleasant one — that lingered into the finish. Oak abounded as well… basically, the wine was just a one-note oaky lemon. Five dollars a quarter-bottle means $20 a bottle, which I wouldn’t even pay in a restaurant for this simplistic mistake. Next up was the 2005 Hayes Ranch Cabernet Sauvignon (Central Coast), which offered a light cherry jello pigmentation and a nose of rose petals. Rather than try to swirl this red in my absurd stemless stem, I had poured some and let it “decant” for ten minutes while I enjoyed the Pacific Vista, and the nose had opened up a bit by the time I tasted it. The rose petals, though, were stalked by a nasty heat, and a fresh pour revealed a mash-up of raspberries, tar, and rubber. Some brown sugar and cherry popsicle also joined the party. I wasn’t prepared for the palate, which was a disaster. Baked. Totally scorched. I can’t imagine what this poor little bottle had been through between it’s presumable release in 2006 and its delivery to my seatback tray two years later… probably been left on more than a few hot tarmacs and taken rides on any number of flights around the world. As my mouth attempted to cope with the glowing embers, I eventually uncovered some cherry cough syrup, but that’s about it. I’m not sure if you can “return” a spoiled bottle on a plane, so I didn’t ask. The only reason I finished the Cab was because I wanted to get drunk and fall asleep as fast as possible. I was intrigued to find, later that night, that a Google search of “Pacific Vista Pinot Grigio” turns up only one useful result: this article from Wine Business. As it turns out, Pacific Vista is a product of Livermore’s venerable Wente Vineyards (not surprisingly, no mention of the brand exists anywhere on Wente’s website). The article talks about how winemakers have a “captive audience” in airplane passengers, and how the airlines provide this great opportunity for customers to develop brand awareness of bottles they like. If brand awareness is the goal, however, then why is AA selling bottles of bulk Pinot Grigio that you can’t buy anywhere but on the plane? Further investigation turned up this thoroughly insulting article, sent to me by new wino Sarah Warner, which made the real dynamic abundantly clear: the “captive audience” to which Wine Business refers is composed exclusively of the first class passengers, not the huddled masses back in coach (who, I think we can all agree, are much more “captive” in those tiny seats than anyone else on the damn plane). Dan Wildermuth, VP of Marketing for Rodney Strong, offers up some unforgivably misguided commentary on the issue: “People will tell you that nobody pays attention to what they drink on the airlines, and I think that might be the case in the back of the bus, but up front people are a little more savvy.” Apart from using a phrase only slightly more loaded than he must’ve been when he uttered it (“the back of the bus?” Really, Bull Connor? ), Wildermuth demonstrates the total obliviousness of not only the airline industry but the so-called “experts” it hires. You want to talk “savvy?” There are two types of people who fly first class — people who travel so frequently on one airline that they can get upgrades with their miles, and people who can’t think of anything better to do with their absurd amounts of money — neither of whom would I expect to be more qualified to appreciate good wine than the high school teacher who was sitting on my left, or the cinematographer sitting on my right. It’s true, the people in coach might not buy a bottle of Dom for no reason, but they absolutely care what they’re drinking. The otherwise Wino-tastic Karen MacNeil chimes in with her own ignorant comment in the above article: “in coach, (airlines) are counting on the fact that your main goal was an inexpensive ticket from point A to point B. And if you want something to drink that you’ll be willing to settle for the equivalent of a French carafe wine.” Are you kidding? When on earth was the last time anyone got an “inexpensive” ticket on a full-service airline? If I wanted no frills, I’d fly Southwest. I do want frills, and frill #1 is palatable wine. The airline industry needs to wake up and start addressing the needs of their true captive audience: the 90% of their passengers who wallow in the “back of the bus.” Tomorrow’s wine drinkers aren’t flying first class today — they’re flying coach, and they’re being turned off by gnarly wines. According to the Wine Business article, an effort has been made by budget carrier Jetblue to up the quality of the wines served in steerage: they’ve hired a sommelier to help them pick interesting bottles, including the first Pinot Noir ever served in coach, and a Merlot from Languedoc. It sounds like JetBlue has the right idea, but they can go further… lets see a white Rioja or a Gruner Veltliner, a spicy Rhone blend or an Argentinean Malbec. As for me, I’m a traditionalist when it it comes to flying (if not when it comes to wine), and I don’t go for these new-fangled “low-cost” airlines with their Airbusses and their seatback TVs. I much prefer to fly the airlines that so enthralled me as a child — United, Delta, TWA, Republic, Eastern, etc. — but my airline of choice, to this day, remains Continental. I love their top-rated customer service, I love their willingness to always give me an exit row seat to accommodate my length, I love that they’re the only domestic carrier still serving free food on each and every flight. I have not tried their wine… I must admit, on planes I tend to be more of a gin man. However, let Continental hereby be forewarned: I will be on a flight within the next three months, I will be flying coach, I will be trying the wine, and I will be reviewing it (and I will be likely to have already been drinking before boarding). The Young Winos are giving you a chance to prove that you’re not as utterly ignorant as the rest of your industry. Don’t let us down. I regret that I did not have a camera onboard, so all I have to offer in terms of images are two stock photos of me on a plane and a picture of both bottles against the backdrop of my airline chair (yes, I have a chair in my house that’s upholstered like an airliner chair from the ’70s, and yes, it’s awesome).